Martin Coles Harman bought the island of Lundy in 1925 intending to found an independant country free of British jurisdiction. Although he was unable to establish his independant country he did create his own postal service between the island and England. 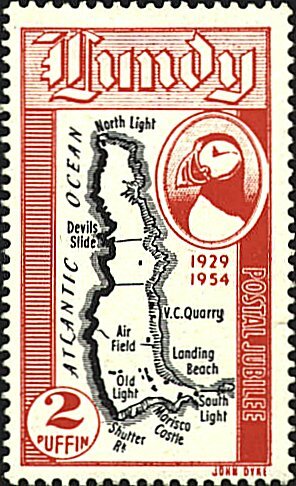 The map stamp was designed by John Dyke and was issued in 1954 in commemoration of twenty-fifth anniversary of the postal service.